Martin Shrkeli, the smirking "Pharma Bro" vilified for jacking up the price of a lifesaving drug, was sentenced Friday to seven years in prison for defrauding investors in two failed hedge funds. The judge insisted that the punishment was not about Shkreli's online antics or raising the cost of the drug. "This case is not about Mr. Shkreli's self-cultivated public persona ... nor his controversial statements about politics or culture," the judge said, calling his crimes serious. 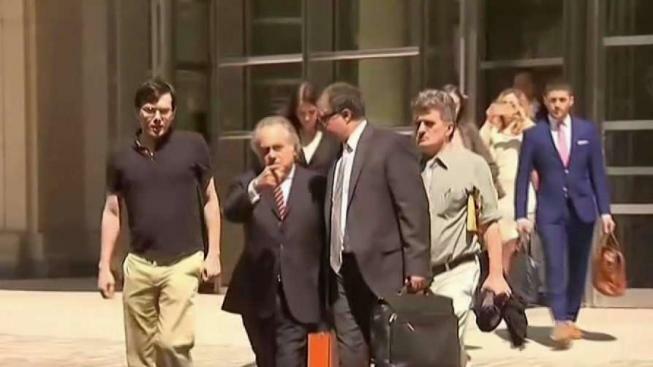 Attorney Benjamin Brafman told Matsumoto Friday that he sometimes wants to hug Shkreli and sometimes wants to punch him in the face , but he said his outspokenness shouldn't be held against him. Assistant U.S. Attorney Jacquelyn Kasulis said Shkreli deserved the stiffer sentence not because he is "the most hated man in America," but because he is a criminal convicted of serious fraud. She said the judge had to consider his history and said he has "no respect whatsoever" for the law, or the court proceedings. "I also want to make clear that Mr. Shkreli is not a child," Kasulis said. "He's not a teenager who just needs some mentoring. He is a man who needs to take responsibility for his actions." After his arrest in December 2015, he taunted prosecutors, got kicked off of Twitter for harassing a female journalist, heckled Clinton from the sidewalk outside her daughter's home, gave speeches with the conservative provocateur Milo Yiannopoulos and spent countless hours livestreaming himself in his apartment. He was tight-lipped when faced with a barrage of questions about the price hike from members of Congress a couple of months later, citing his Fifth Amendment right not to incriminate himself. After the hearing, he tweeted that the lawmakers were "imbeciles." Things abruptly changed, though, last fall after he jokingly offered his online followers a $5,000 bounty to anyone who could get a lock of Hillary Clinton's hair. The judge revoked his bail and threw him in jail, a decision that she defended Friday. That didn't tame Shkreli completely. He corresponded with journalists, ridiculing the personal appearance of one female reporter who asked him for an interview. Before sentencing him, the judge said that it was up to Congress to fix the issue of the HIV price-hike. And she spoke about how his family and friends "state, almost universally, that he is kind and misunderstood" and willing to help others in need. She said it was clear he is a "tremendously gifted individual who has the capacity for kindness." Other testimonials were as quirky as the defendant himself. One woman described how she became an avid follower of Shkreli's social media commentary about science, the pharmaceutical industry, but mostly, about himself. She suggested that those who were annoyed by it were missing the point. "I really appreciate the social media output, which I see on par with some form of performance art," she wrote. Another supporter said Shkreli's soft side was demonstrated when he adopted a cat from a shelter — named Trashy — that became a fixture on his livestreams. Another letter was from a man who said he met Shkreli while driving a cab and expressed his appreciation at how he ended up giving him an internship at one of his drug companies. In court filings, prosecutors argued that Shkreli's remorse about misleading his investors was not to be believed. "At its core, this case is about Shkreli's deception of people who trusted him," they wrote.